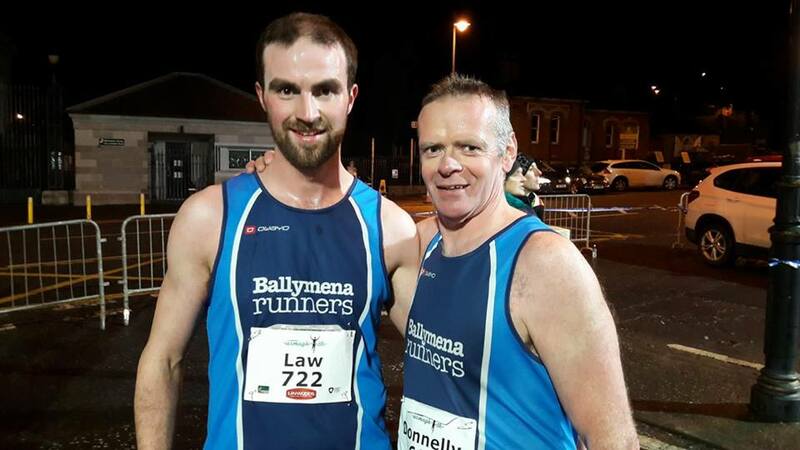 PB's for Kerry Bamber and James Hamilton in Armagh, Gillian Wasson comes third in the Mournes and Mark picks up an age category win. Five BRAC runners travelled down to Orchard County last Thursday evening to take part in the various Armagh International Road Races being held around the famous Mall. First up was the Ladies 3k including International, Open and Masters Ladies. British International Laura Weightman won in a fast time of 8 minutes 59 seconds. Kerry Bamber (52nd) ran a personal best and club record, on the road, of 10:29s with Geraldine Quigley (92nd), who managed to get a late entry into the race, 11:39 ... well done ladies. Next up was the Men's International and Open 5k (limited to runners who have broken 16 minutes). Runners travelled from near and far to compete. Sam Stabler, who recently competed for GB in the European XCountry Championships, won the race in 13 minutes 59 seconds, while an amazing 90 men finished below 15 minutes! Interestingly Welsh Athlete Dewi Griffiths ran 14.07 a few months after his 2.09.49 Frankfurt Marathon. Club track star James Hamilton (147th) ran a personal best and club record, on the road, of 15:21 ... well done James. The final race was the Open 3k. Again the standard was excellent with David Law (34th) setting a big personal best (9:35) and John Donnelly (153rd) 11:22 also a best time ... well done guys. Ballymena Runners travelled to the Mournes on Saturday to raise money for the Mourne Mountain Rescue Team. Starting in Donard Park, the runners followed the Donard Trail to the climb up the Granite Trail steps, were they ascended the old Bogie Line to the top of Donard Park. From this point, the field made their way across the short mountain path to the viewpoint at Thomas’s Quarry. The route then followed the trail along the top of Donard Park over to the race’s highpoint at the top of Drinnahilly. It was all downhill from there, as competitors descended to Donard Park and the finish line. The course measured 5 miles in distance and included approximately 300m of ascent. Gillian Wasson was third lady home with Mark Alexander picking up his age category (V45). Emma Donnelly continues to progress well off road with Aidy Dodds debuting in the Mournes.